The Corsair K63 compact mechanical keyboard with Cherry MX Red switches is $20 off on Amazon. Nothing beats a mechanical keyboard when it comes making typing feel luxurious, regardless of whether you're filling out documents or riding the WASD keys to combat alien hordes. If you haven't embraced the mechanical life yet, The Corsair K63 with Cherry MX Red switches is only $60 on Amazon today. That's about $20 cheaper than the usual price, and the lowest price it's ever been. This compact keyboard isn't part of PCWorld's mechanical keyboard round-up, but Corsair's keyboards tend to be designed very well, and this particular model is well reviewed on Amazon and elsewhere. Between the lack of a discrete number pad and the Cherry MX Red switches, this keyboard will likely please gamers more than spreadsheet warriors. Cherry Reds are optimized for responsive gaming; there's no tactile feedback with this switch, and it requires very little pressure to actuate the key. The design allows for faster key presses, meaning Geralt can duck a punch from a troll that much faster. That's not to say you couldn't use the Corsair K63 for professional typing. It's just that you might find this keyboard to be a little more touchy for typing out words and numbers for hours on end compared to a keyboard equipped with, say, Cherry MX Blue switches. The missing number pad may bother full-time spreadsheet warriors, too. Cherry Reds also don't make much sound, which may bother typists who are used to at least some clickety-clack even with rubber-domed keyboards. 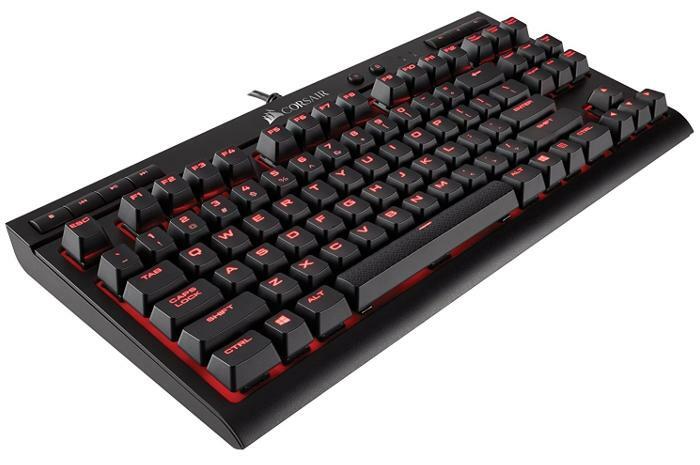 The Corsair K63 compact mechanical keyboard comes with per-key red LED backlighting, anti-ghosting with full key rollover, and dedicated volume and media controls.